Cane Creek Cascades was roaring. After two days of rain Cane Creek was really flowing good. You will be hard pressed to find any good pictures of this cascade at high flow conditions like this. The "cascade" part of the waterfall is nearly nonexistent. 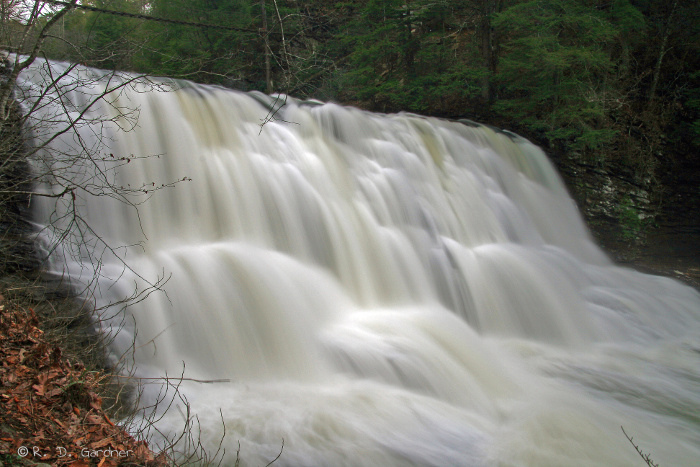 The waterfall plunges 45 feet just behind the nature center for Fall Creek Falls State Park. 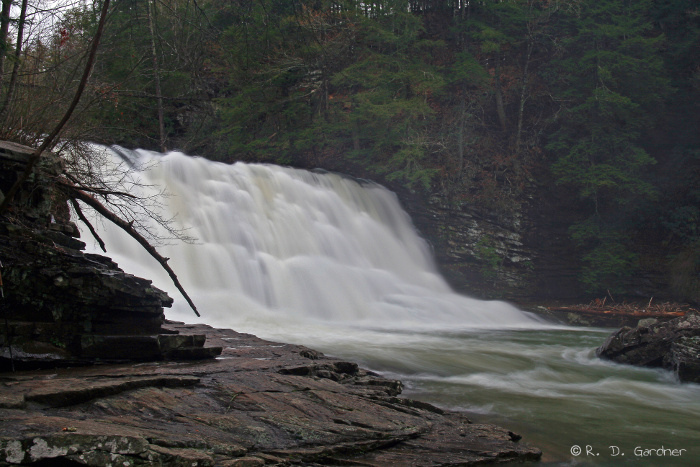 A few hundred feet further downstream the creek falls into twhe Cane Creek Gorge at Cane Creek Falls.. This is a great place to visit. The cascade is located just a few feet behind the nature center. Follow the signs in the park for the nature center and you'll be there in no time. 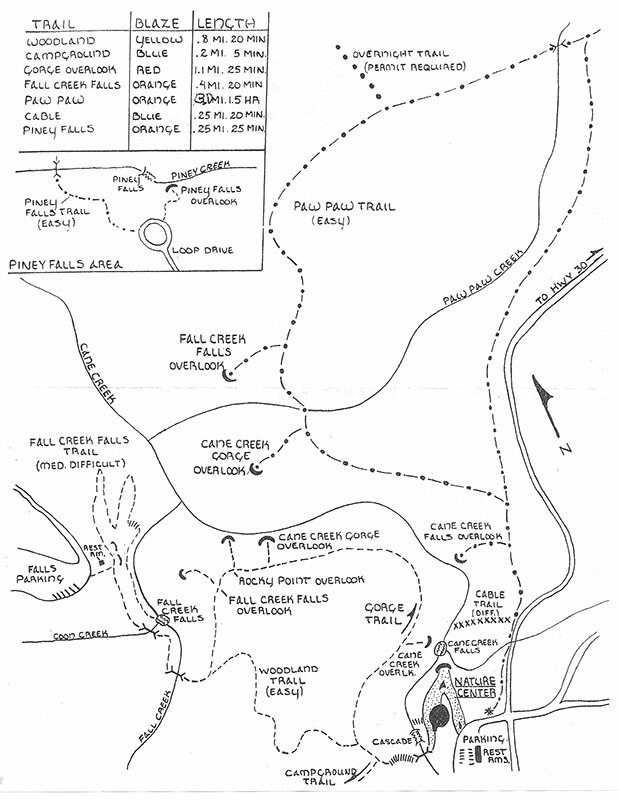 As there are a minimum of two different roads into the park, I recommend you use the following link to customize your own directions to Cane Creek Cascades. No hike. Go around behind the nature center and follow the boardwalk down to a viewing area for the cascades. In the summertime the flow is much lower and kids routinely play at this waterfall. Honestly I'm not sure what time is best to visit the waterfall. I was there both in the evening and in early morning. Both times I had harsh lighting. Part of the problem was the volume of water. Part of the problem was the skyline in the background. Part of the problem was the heavy overcast skies, believe it or not. Due to its location your best bet is going to be either early or late. And I think with lower water flow the cascade will photograph a bit easier. As always I recommend the use of a polarizer to cut down on reflections. I color corrected the photos with Photoshop when I got home. Being a cascade you'll want to use a long-ish shutter speed so a good tripod is a must. This type of waterfall begs for a slow shutter speed.